I found this book at my favorite used book stores the other day. Used to, if I wasn’t at home, I was at Katy Budget Books. I started reading it on the 1 ½ hour drive home. I’ve had a hard time putting it down to participate in life. Jacob Jankowski says: “I am ninety. Or ninety-three. One or the other.” At the beginning of Water for Elephants, he is living out his days in a nursing home, hating every second of it. His life wasn’t always like this, however, because Jacob ran away and joined the circus when he was twenty-one. It wasn’t a romantic, carefree decision, to be sure. His parents were killed in an auto accident one week before he was to sit for his veterinary medicine exams at Cornell. He buried his parents, learned that they left him nothing because they had mortgaged everything to pay his tuition, returned to school, went to the exams, and didn’t write a single word. He walked out without completing the test and wound up on a circus train. The circus he joins, in Depression-era America, is second-rate at best. 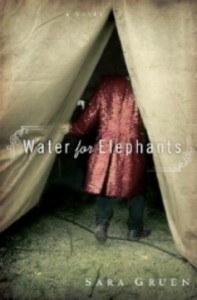 With Ringling Brothers as the standard, Benzini Brothers is far down the scale and pale by comparison.Water for Elephants is the story of Jacob’s life with this circus. Sara Gruen spares no detail in chronicling the squalid, filthy, brutish circumstances in which he finds himself. The animals are mangy, underfed or fed rotten food, and abused. Jacob, once it becomes known that he has veterinary skills, is put in charge of the “menagerie” and all its ills. Uncle Al, the circus impresario, is a self-serving, venal creep who slaps people around because he can. August, the animal trainer, is a certified paranoid schizophrenic whose occasional flights into madness and brutality often have Jacob as their object. Jacob is the only person in the book who has a handle on a moral compass and as his reward he spends most of the novel beaten, broken, concussed, bleeding, swollen and hungover. He is the self-appointed Protector of the Downtrodden, and… he falls in love with Marlena, crazy August’s wife. Not his best idea. 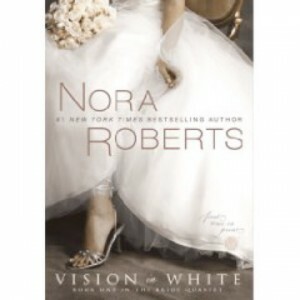 Even though I’m still reading Nora Roberts’ Vision in White (every time I open the book to read it, I end up falling asleep shortly afterwards due to exhaustion and my sleepy pill working really fast! 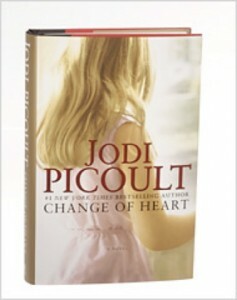 ), I have read Change of Heart by Jodi Picoult. I LOVE her stories! I can’t say it enough, I la-la-la-love them! Shay Bourne – New Hampshire’s first death row prisoner in 69 years – has only one last request: to donate his heart post-execution to the sister of his victim, who is looking for a transplant. Bourne says it’s the only way he can redeem himself…but with lethal injection as his form of execution, this is medically impossible. Enter Father Michael Wright, a young local priest. Called in as Shay’s spiritual advisor, he knows redemption has nothing to do with organ donation – and plans to convince Bourne. But then Bourne begins to perform miracles at the prison that are witnessed by officers, fellow inmates, and even Father Michael – and the media begins to call him a messiah. Could an unkempt, bipolar, convicted murderer be a savior? It seems highly unlikely, to the priest. Until he realizes that the things Shay says may not come from the Bible…but are, verbatim, from a gospel that the early Christian church rejected two thousand years ago…and that is still considered heresy. Change Of Heart looks at the nature of organized religion and belief, and takes the reader behind the closely drawn curtains of America’s death penalty. Featuring the return of Ian Fletcher from Keeping Faith, it also asks whether religion and politics truly are separate in this country, or inextricably tangled. Does religion make us more tolerant, or less? Do we believe what we do because it’s right? Or because it’s too frightening to admit that we may not have the answers? ANOTHER book from my book worm friend…. she sure knows how to pick ’em!! I’m only about 1/3 of the way through this book, and so far it’s been a great read. I love weddings, even though I’M DONE with that sort of thing. The fairy tale is still alive……. By the time she was eight, Mackensie Elliot had been married fourteen times. She’d married each of her three best friends — as both bride and groom — her best friend’s brother (under his protest), two dogs, three cats, and a rabbit. Though the dissolutions were invariably amicable, none of the marriages lasted beyond an afternoon. The transitory aspect of marriage came as no surprise to Mac, as her own parents boasted two each — so far. You are currently browsing the Yankee Wife blog archives for July, 2009.